A STUDENT at Bishop Burton College has completed a 60km endurance ride on horseback through the rolling plains of Assam in India. Amber Sole, 17, an experienced endurance rider, carried out the feat earlier this month on a borrowed horse in the region of Dibrugarh. The ride was set into three 20km loops around a tea plantation. Amber was loaned an Indian thoroughbred called Aurum for the competition. She said: "When setting off, I felt slightly nervous and apprehensive as I was riding a different horse to one of my own that I am used to. "The terrain was flatter than I expected and very dusty. "The route was well marked out and was set out with flags and many checkpoints, which was reassuring..."
Abu Dhabi: Five cars including a Bentley and a total prize fund of Dh1.25m will be up for grabs in three endurance rides to be held over the next three days starting Friday at the Emirates International Endurance Village in Al Wathba. The 100km Shaikh Mohammad Bin Mansour Bin Zayed Al Nahyan Endurance Cup for Private Owned Horses will be run on Friday, the 120km Shaikh Rashid Bin Hamdan Al Maktoum Challenge Festival ride takes place on Saturday and the 120km Giants Endurance Challenge goes on Sunday. “An amount of Dh350,000 will be distributed to all riders who finish the Shaikh Mohammad Bin Mansour Bin Zayed Al Nahyan Endurance Cup race, while the winner will get a Nissan car. Saturday’s winner in the 120km Shaikh Rashid ride will get a car, while all those who finish will get a share of the Dh400,000,” said Adnan Sultan Saif Al Nuaimi, Director-General of Abu Dhabi Equestrian Federation, at a press conference held at the Eastern Mangroves Hotel on Thursday. “The Giants Endurance Challenge is the most prestigious of the three rides and a Bentley along with two other cars will be given to the top three, while the total prize money for those who finish is Dh500,000..."
A delegation led by Paul Côté, President of the Bromont Bid Committee, was at FEI Headquarters today to make an in-depth presentation to the FEI Evaluation Commission as part of the final stages of the bidding process for the hosting rights to the FEI World Equestrian Games™ in 2018. The seven-strong team which presented the official Bromont and Montreal bid book to the Evaluation Commission also included the Mayor of Bromont Pauline Quinlan, President of Equine Canada Mike Gallagher, President of Bromont International Roger DesLauriers, technical advisor Leopoldo Palacios, and President of the Bromont Olympic Park Marcel Bundock. The presentations were led by the Bromont Bid Director Benoit Girardin. The presentation included details on the delivery of the sport, including horse welfare and anti-doping, the competition venue in Bromont, the financial plan and revenue generation strategy for the 2018 Games, the public and private partners, the local organising committee, risk management and security, and the legacies to Canadian equestrian sport if the Games are awarded to Bromont. The Bromont bid committee plans to use the Montreal 1976 Olympic Stadium for the opening ceremony, and the Bromont Equestrian Park, which staged the equestrian events in the 1976 Olympic Games, is the proposed venue for all seven disciplines at the FEI World Equestrian Games™ in 2018. The FEI Evaluation Commission will now produce a full report for the FEI Bureau. Once that has been reviewed by the Bureau, the Bromont bid team will return to Lausanne for the in-person Bureau meeting at FEI Headquarters. Originally scheduled for 10-11 June, the meeting has been moved to 1-2 July. Appropriately, the Bromont team will present to the Bureau on Canada Day, 1 July, prior to a Bureau vote to decide on the allocation of the FEI World Equestrian Games™ 2018. The FEI Evaluation Commission is made up of Secretary General Ingmar De Vos; Commercial Executive Director Carsten Couchouron; Jumping Director John Roche; Dressage Director Trond Asmyr; Eventing & Olympic Director Catrin Norinder; Endurance Director Ian Williams; Non-Olympic Sports Director Bettina de Rham; General Counsel Lisa Lazarus; Veterinary Director Graeme Cooke, Director Governance and Executive Affairs Sabrina Zeender, and Press Relations Director Grania Willis. The « Grand Parquet Endurance » association is happy to present you with a new event happening in France : an International Endurance Ride Competition (CEI ***, CEIY ** ** IEC, IEC *) taking place in Fontainebleau on march 30-31 2012. The event is hosted on the « Grand Parquet » spot, one of the most beautiful equestrian site in France, very comfortable, as well for the horses as for the riders. The courses are displayed in daisy shape around the site, in the magnificent Fontainebleau Forest, on excellent quality grounds (almost no asphalt). Electronic timing will be applied to the riders. Fontainebleau is a city deeply attached to its equestrian heritage. Since François I to Napoleon III, the kings of France favored Fontainebleau and its surroundings for exceptional hunting. Built in 1920 on a former site of "hunting shooting" Royal Hippodrome Grand Parquet quickly became a prestigious race. It is called the "Parquet of the Emperor" and the high society of the time were found there. It was around 1950 that this site was redesigned to become a place of equestrian competitions, suitable for all disciplines. Since then, every year, the Grand Parquet hosts high level equestrian competitions, as well as many sporting events and events. While our association will celebrate its Grand Parquet Stamina third year of existence next summer, the appointment given to all endurance enthusiasts on the site of Grand Parquet Fontainebleau became a fixture of the season starts! After a successful first edition in 2011 (* and ** level), our association was entrusted in 2012 to organize a round selective for Team France at the World Championships (160 km - ***) a guarantee of confidence Federation to our knowledge. No time to rest for 2013 is looming as a step further: a double selective. It is with great pride that we have accepted the challenge of organizing a round selective Seniors Team France in the upcoming European Championships to be held at Most in the Czech Republic, as well as handle selective for Youth Team of France in the upcoming World Championships, to be held in Tarbes! Be assured that here each member of the association will give the best of himself to make this new edition a success. I want to thank our many supporters, without whom this adventure would not have the same flavor. They know and recognize. I conclude by wishing you, on behalf of the association Grand Parquet Stamina and all its members, an excellent year of endurance and a good preparation for the 29 and 30 March 2013. The French Championship will be held at Castelsagrat from 17 to 19 May 2013. Races run during this weekend will go from 110 to 160 km and will be part of the selection for the France team. The courses are as Daisy, with 5 different loops from 18 to 33 km. Endurance horse riders from all over New Zealand and overseas descended on Marlborough to take part in the two-day CopRice and South Island endurance and competitive trail riding champs (CTR). The event was based up the Waihopai Valley on the old Bankhouse Station, leased by Big Bale Contracting and belonging to Ara Vineyards, and took in several farm properties and vineyards. There were 15 entries from the North Island, among them overseas riders based in Wellington for the season. But the February 16-17 weekend belonged to Nelson Lakes rider Alison Higgins, riding the Canterbury-bred, owned and trained Arabian gelding, Northwinds Apollo. Australia: Tom Quilty Gold Cup Endurance Ride - to Complete is to Win! Australia’s iconic endurance horse ride, the Tom Quilty Gold Cup, will be held at Kilkivan in south-east Queensland from 7 – 9 June 2013. Riders, horses and strapping crews will travel from across Australia and overseas to compete in this ultimate test of endurance, where participants aim to complete the 160km course within 24 hours. For most competitors, the overall aim is to complete the five-leg course and receive an esteemed Quilty Buckle award. In the spirit of the ride’s motto – To Complete is to Win – a specially crafted belt buckle goes to every successful competitor in recognition of the high standard of horsemanship required to complete the rigorous course. Endurance GB is pleased to confirm the news that broke yesterday. The Royal Windsor Horse Show, which takes place in Windsor Great Park from the 8th to 12th May, will for the first time include an Endurance competition. Discussions have been taking place for some time and Endurance GB board member and FEI 4* judge, John Robertson, has been involved in advising the organisers. The organisers of the show have secured sponsorship for the competition from Bahrain. There will be just one class: FEI 2* 120km, which is scheduled for the 12th May. It is such a beautiful venue but the ride will obviously have to share space with the other disciplines at the Show. However, it's a great opportunity for Endurance to be seen by more people. With the Royal Windsor Horse Show celebrating its 70th anniversary this year, it promises to be an event to remember! Competing were invited 'guest' GBR rider, Dace Sainsbury, with her horse Ballotta, who travelled out from the UK; and Emma Finnie who is based in the UAE. Emma Finnie finished in 11th place at an average speed of 24.895 kph. A great result for her! Congratulations. Emma is based in the UAE and was riding a locally trained horse belonging to the well know Al Wathba stables. Sadly for Dace Sainsbury Balotta (Lottie) did not pass the Re-examination at VG5, with 16km to go. Failed on pulse. Such a shame, but well done Dace and Lottie. Dace's Snow Team finished 7th overall out of 16 declared teams at the start. Two of our teammates were fortunate to finish; Jeanne Holum (NOR) and Natalie Terberova (CZE). The winning team was Al Nasr 1 Endurance Stable with 3 finishers. The other European Team uniting France, Spain and Portugal were 4th. The first combination to finish was Mohd Ali Al Shafar (UAE) and Orman de Cardonne (11 year old Arab Gelding). Average speed was 26.201 kph (31.631 kph on the final loop). They were in 23rd place at the first vetgate but ran up with the leaders for most of the race. (MENAFN - Khaleej Times) Ahmed Mohammed Al Jaber completed a hat-trick of wins as he guided Omani Quandara to victory in the Shaikh Zayed bin Mansour bin Zayed Al Nahyan Endurance Cup for private-owned horses at the Emirates International Endurance Village in Al Wathba, Abu Dhabi, on Saturday. The CEN 100 kms was run in four phases of 33kms, 27 kms, 24 kms, and 16 kms. It drew 67 riders. Al Jaber had won the previous two editions of the competitions. Shaikh Zayed bin Mansour bin Zayed Al Nahyan gave away the prizes. Also present were Adnan Sultan Al Nuaimi, director general of Abu Dhabi Equestrian Club, Lara Sawaya, director of the Shaikh Mansour bin Zayed Al Nahyan Global Arabian Flat Racing Festival and Head of IFAHR Ladies Racing, Stephen Bowey, Executive Director (corporate development) Invest AD, and Saif Al Awani, managing director of Al Awani. The total prize money on offer was Dhs half-million including a car for the winner. Nineteen-year-old Jaber completed the ride with a time of three hours, 46 minutes and nine seconds with an average speed of 26.531 kmph. It was seven-year gelding Omani Quandara's first and the winning horse belongs to Al Jaber Stables. Jaber, who finished first in the first stage, never looked back and went on to win the remaining three stages to emerge a comfortable winner. "It was a quite a tough ride as it attracted new stables also who have strong horses ," said Al Jaber. Mansour Ibrahim Ahmed, who was riding Rezongo El 1 finished second clocking 3.50.34 with an average speed of26.023 kmph while Azaam Aref Own Al Kahtheeri timed 3:50.34 on Capa Negrafrom Al Ain Endurance Stables to take the third spot. The fourth place went to lady rider Layla Abdul Aziz Al Redha who partnered Waleed (AE) from Al Giyad Stables. She clocked a time of 3. 56.23, followed by Yousif Mohammed Hassan Al Hammadi (3.56.24) on Nara from Al Rawahel Private Stables. Stolen horses in the country of Lesotho are rounded up and held in government pounds. Horses in the Lesotho Pounds endure harsh conditions with no food or water. Many starve to death or die of dehydration while waiting to be claimed. 2) Improve conditions through cooperative collaboration amongst the government, police, stock theft units, horse owners, concerned citizens, and donors. The Lesotho Rescue Ride is a seven day trek from South Africa into the tiny country of Lesotho and back out. The ride was created to raise awareness about the plight of the horses within the Lesotho Government pounds. The Ride is an effort to work with local government officials and international riders to raise awareness and funding for the Lesotho Pound Rescue Project. Who: All Adventure riders are welcome. The inaugural ride will be launched by Mongol Derby alumni, but all adventure riders willing to pony up the dough are welcome. This is NOT a tourist trek. The ride will be limited to riders that have demonstrated experience in adventure riding and horsemanship. Horses will be provided for this ride and their safety and welfare is paramount. The ride will be long and tough over challenging terrain with a real danger from horse thieves. Navigation will be done via gps along a set track. No guides will be provided. What: Seven day rough trek from South Africa into the country of Lesotho and back out. Estimated six hours a day of hard riding. Endurance riders at the Easter carnival in the Mary Valley will get their last chance to qualify for the famous Tom Quilty Gold Cup National Championship event being held in Kilkivan this year. The new feature event - a 160-kilometre “Tom Quilty Queensland Qualifier” was added to the Far A Way Easter Endurance Carnival, FAW president Geoff Fisher said. “With the annual rotation of the Tom Quilty around Australia, it will be six years before Queensland riders again have the chance to compete in their own state,” Mr Fisher said. Endurance horse riders from across Australia will join international competitors at Imbil this Easter to compete in a huge endurance riding program developed by event organiser, Far A Way Riders Association (FAW). Events ranging from 20km to 320km see the Easter carnival as the annual highlight for many Queensland endurance riders and others from across Australia. It is anticipated that more than 300 competitors and their horses will camp at the Imbil Showground over the holiday period along with their support crews and families. This event will add to the busy Easter weekend population of Imbil by more than 1000 people. The signature Easter Endurance Carnival event is the 320km marathon spanning four days, and an experienced team of equine veterinarians headed up by Jon Fearnley, the 2013 Tom Quilty Gold Cup Head Veterinarian, will be working throughout the carnival to assess and ensure horses’ fitness to continue in the competition. Many competitors say that it is fortunate that riders are not given the same scrutiny. First timers are encouraged to “come and try” in the 20km introduction event which Mr Fisher said provided a great opportunity for those who wish to give endurance a try as experienced pace riders provide support throughout the event. Other events include a 120km mini-marathon event, two 80km Open events and two 40km training events. Mary Valley locals figure highly on the national level with Kenilworth rider, Brook Sample, a six-time winner of the Tom Quilty Gold Cup, including in Tasmania in 2012. The Sample family will have four generations at the Easter Endurance Carnival. Peter Pike also a Kenilworth rider and longtime FAW committee member will again defend his record winning run in the 320km marathon event. From its humble beginnings at Kenilworth in 1987, the Far A Way Riders Association has become a powerful force in Australian endurance. Twice it has organised and hosted the Tom Quilty Gold Cup event, and has also hosted FEI internationally affiliated championship events at Imbil. This year FAW is focusing on the Easter Endurance Carnival events, the Sparkler afternoon/evening event in September and a series of education and training days throughout the year. Manama, Feb. 21. (BNA) – The Bahrain Royal Equestrian and Endurance Federation (Breef) has finalised all arrangements ahead of the King's Cup Endurance Ride Championship tomorrow. The most prestigious and awaiting endurance ride of the season is set to take place at the Bahrain International Endurance Village in Sakhir and is over 120km. It will be divided into five stages, commencing with 30km for the first stage. It will be followed by a similar 30km distance for the second, while each of the remaining three stages will be over 20km. There's also a second race on Saturday, an 80km qualifying ride which is open for juniors. It comprises three stages, including 30km each for the first and second stages, and concludes with a 20-km stage. The veterinary examination is scheduled for today from 3.30pm to 5pm at the veterinary area inside the village. Examination will be conducted by a team of experienced veterinary commission, headed by Yassine Motemri of Tunisia. Foreign veterinary delegate is Mohammed Al Hammad of Saudi Arabia. Veterinarian members include Jean Marc of Belgium, Piotr Szpotanski and Wojciech Piekalkiewicz of Poland, Oman's Hadi Al Lawati and Khalid Al Ruziaiqi and India's C V Niranjan. Other members are Zahid Rafiq of Pakistan, Bahrain's Ebrahim Yousif, Sab ah Al Kabie, Abu Obaidah Yacoob, Abdulrahman Abu Shook and Saudi Arabia's Hassan Hashim. The treatment veterinarians are Fareeda Abdulrazq of Bahrain and Caonabo Melo of the Dominican Republic. Maximum allowed weight for the rider is 75kg, including the saddle, for the 120km ride. The allowed weight for the 80km event participants is 70kg, also with the saddle. The organising committee, headed by Breef president Shaikh Khalid bin Hamad Al Khalifa, has formed the ground jury. Denis Kevin Croke of Ireland was named President of Ground Jury, with Ghalib Al Alawi, Mahdi Al Kalati, Fahad Al Rumaihi and Ali Ghuloom being members. Mohammed Dadulla is the foreign technical delegate, Haider Al Zubi is the chief steward and Abdulla Al Rumeihi was appointed race steward. Sudip Sankar is the show secretary. Meanwhile, riders from Bahrain and the UAE resumed preparations yesterday as they hope to pull off an outstanding win tomorrow. To be led by Royal Team captain Shaikh Nasser, Bahrain's riders are likely to face a stern challenge from their UAE counterparts. Shaikh Hamdan bin Mohammed Al Maktoum, the Dubai Crown Prince, will be leading a strong field of UAE riders in tomorrow's big event. The UAE riders arrived yesterday and will be training and the endurance village today. Breef endurance committee head Shaikh Daij bin Salman Al Khalifa affirmed the federation readiness for the season's much-awaited endurance championship. Shaikh Daij said he believes that the King's Cup ride will live up to the occasion, welcoming the UAE riders who have come from different stables to participate. On his part, Shaikh Ahmed bin Saqer Al Khalifa of Bahrain's Al Fateh Stable said the race promises to be a high-paced event and will unarguably produce one of the most exciting competition among some of the region's prominent riders. London, Feb. 20. (BNA) – Bahrain is organising an international endurance horse ride on May 12 in the UK on the sidelines of the 2013 Royal Windsor Horse Show. The ride is one of a variety of equestrian competitions that will take place over four consecutive days in this year's festival, set to commence on May 8. In this regard, Supreme Council for Youth and Sports chairman and Bahrain Olympic Committee president Shaikh Nasser bin Hamad Al Khalifa met show organisers Simon Brooks, Michael Shephard, Sarah Rutherford in London. During the meeting, the show organizers presented Shaikh Nasser with details of the programmes and activities. Shaikh Nasser said the Kingdom of Bahrain Ride will see the cream of endurance riders from Bahrain, the UK and other countries across the world competing it out for glory. Shaikh Nasser affirmed Bahrain's keenness to be part of this wonderful festival, to be held at the private grounds of Windsor Castle and is patronised by Her Majesty the Queen Elizabeth. The Bahrain Royal Endurance Team captain also stressed on His Majesty King Hamad's directives to promote the civilisational and development achievement of Bahrain in international events. On his part, Brooks expressed appreciation to Shaikh Nasser for his efforts in supporting equestrian sports in Bahrain, which had astonishing sporting achievements in the past years thanks to the continued backing of His Majesty King Hamad. The four-day festival has a wonderful mix of International Carriage Driving, Showing, Equestrian Displays and first class Jumping. There are classes for the grass roots competitor right through to top international riders. There are four arenas at Royal Windsor all with a full programme of national and grass roots show jumping as well as Military Services and Pony Club jumping competitions. The Royal Windsor Horse Show hosts one of the most important driving events in the UK. The Land Rover International Driving Grand Prix includes an FEI World Cup Qualifier for the Four-In-Hand class. 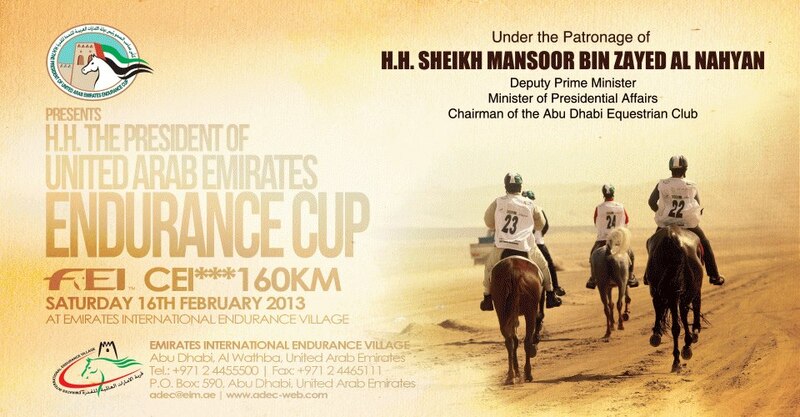 February 16, 2013, Abu Dhabi ~ One hundred and thirty-two riders started into the desert for the ultimate prize in the FEI 160km CEI*** President of the UAE Endurance Cup at Emirates International Endurance Village on Saturday morning (16 FEB). While the outcome of the Abu Dhabi Presidents Cup wasn't what the girls expected, the experience was everything and more. With 132 starters, and with the winners finishing the FEI*** 160-km race in 6:07.08 at an average speed of 26.14 km/h, Jessica DiCamillo and Devan Horn concentrated on their own ride, concentrating on their objective of 16 mph (10 mi/h). Jessica rode DJB Black Al Badi (aka Diesel) owned by Darolyn Butler, and Devan Horn rode CJS Maverick owned by Ceci Butler and Jason Stasiuk. It wasn't to be for Devan early in the ride: "Maverick and I unfortunately retired after 40 miles for a slight front end lameness, but we did such a good job while we were riding! Jessica and I were literally in last place and maintaining our goal of 10 mph." Ceci Butler-Stasiuk also participated in the ride on a horse owned by Shaikha Madiya al-Maktoum, but it was not to be for Ceci either. Her horse was eliminated for lameness at gate 2. The USA contingent of grooms and friends and parents had high hopes for Jessica and Diesel finishing, but the gelding was eliminated on metabolics at the next to last gate 5. The eliminations didn't dampen their enthusiasm for this biggest ride in Abu Dhabi, which for the first time invited Young Riders from around the world. Devan said, "[Jessica and I] and all of our crew had an amazing time and such a wonderful experience here in Abu Dhabi. I'd like to thank all of our crew and everyone who helped us get here! I am so lucky to have gotten the chance to come over and ride!" Mohammed Ali Al Shafar, aboard Orman Du Cardon, landed the 160-km FEI HH The President Endurance Cup for Al Reeh Endurance Stables to drive home a brand new car plus the precious Gold Cup and the mouth-watering prize-money at the Al Wathba International Endurance Village here on Friday. The winner covered the distance in 6 hours, 6 minutes and 24 seconds at an average speed of 26.20 km/hr. Abu Dhabi: Saudi Arabia’s Ayah Khalil Rafia is among the strong contingent of riders who will be taking part in Friday’s 100km Shaikha Fatma Bint Mansour Bin Zayed Al Nahyan Ladies Endurance Cup at the Emirates International Endurance Village in Al Wathba. Ayah, along with other lady riders from the UAE and other countries in the region — including some who are here for Saturday’s HH The President’s Cup — will be seen in action in Friday’s national ride. When we start talking about security or safety issues, what exactly does that mean for a major sporting event like the the Alltech FEI World Equestrian Games™ 2014 in Normandy? We’re talking about guaranteeing the safety and security of both people and property. There are three major aspects to cover when it comes to the Games: 1) Security - that includes general and property guarding services, 2) Safety - preventative measures to protect people and property (e.g. fire risks), 3) Health and safety - security services don’t usually handle this third category but we’re breaking new ground here with the Games! This is also my first equestrian competition after twenty-five years of experience in sporting events…So this will be a first in more ways than one! Bearing in mind the exceptional nature of our event, that’s to say ten disciplines in eight different sites, does this bring any specific security challenges? Yes, of course! First of all, we will be in the global spotlight and it’s the first time this type of competition is being held in France. Then there are the expectations and long-term benefits (15 years) for the region of Normandy to consider and the FEI and sports directorate requirements... All these particular points mean that we can’t leave anything to chance! And don’t forget, we have to manage ten different events, each with their own specific requirement. This means ten times more constraints for us to deal with compared to an event like the French Open - each equestrian discipline has its own regulations. There will also be eight competition sites for us to handle, some of which are outdoor whilst others are indoor: the Caen exhibition park “Parc des Exposition”, the Zénith centre, Hippodrome de la Prairie racecourse, the D’Ornano Stadium, Le Pin National Stud, Sartilly, Deauville and St Lô. We are therefore going to work very closely with the FEI and the different departments of the Organising Committee so that we can get everything ready for big day! What will be 2013’s major tasks for your department? We have three main tasks for 2013: 1) to identify each department’s needs 2) to issue calls for tenders and 3) to make a pre-selection of service providers who match our requirements. We will have to take into account the specific demands of each discipline and each department to be able to identify all their needs properly. For example, the sports department will ask us to recruit staff to ensure public safety along the endurance course. It’s our role to understand and anticipate their requirements before deciding upon the type of person we need to call in (professionals or volunteers) and how to position these people along the course. As for the call for tenders, we’re not going to reinvent what’s already been done before: we’re going to base our strategy on what already happens at other major sporting events. We will then simply adapt it to the particular needs of our event. The selection of service providers will be divided into three key areas: environment, place and expertise of each. Seeing as all three areas need to be managed differently (security, health and safety), it’s more than likely that we will go for several different service providers to guarantee the very best service. It will also be vital to anticipate law enforcement requirements. This does of course depend on the number of people expected at the event: we’re estimating about 500,000 over the course of two weeks! You’ve still got 559 days to go before the event, but do you already know what type of security strategy needs implementing during the games in 2014? Or how you are going to safeguard the security of an expected 500,000 visitors? Fortunately for us and thanks to our extensive experience, we can draw parallels with existing security, health & safety organisation at other events. As we see it, it’s a mix between what happens at the Parc des Princes football stadium, the Stade de France stadium, the Tour de France cycling race, the French Open and the FIFA World Cup™. We are basing our model on these events but as each event is unique we will be adapting it to the particularities of the World Equestrian Games. For the moment, we have a basic strategy in mind but the more meetings we have, the more we have to reconsider and fine tune certain points. It’s therefore highly likely that the resources will be upped by 20% in the coming months. One thing’s for sure: we’re looking at everything in minute detail to make sure that nothing disturbs the event! *About Franck Tchavouchian: twenty-five years of experience in major sports event management, with ten years at the head of his own security/health & safety consultancy created in 2002. In particular, Franck has overseen the Tour de France cycling race, the French Open and the Paris-Dakar Rally. USA Young Riders Jessica DiCamillo of New Mexico and Devan Horn of Texas arrived in Abu Dhabi on February 9th in anticipation of riding in the February 16th 160-km Presidents Cup. Jessica will be riding DJB Black Al Badi (aka Diesel), owned by Darolyn Butler, and Devan will be riding CJS Maverick, owned by Jason and Ceci Butler-Stasiuk. Ceci has been in the UAE the last couple of weeks, riding in endurance races on horses owned by Shaikha Madiya. "Jason and the ponies arrived safely and in very good health," Ceci said this morning. "And so did the rest of the of the young U.S. team!!! They where both bright & bushytailed after such a long trip!! We are all very privileged to be here as an endurance family." Ceci will also ride in the Presidents Cup on one of Shaikha Madiya's horses, where over 200 entries are expected. Amber Sole, 17, from Hessle, East Yorkshire, set off for India this week to take up an opportunity to compete in a 60km endurance ride in India on 2nd February, riding a borrowed horse. The invitation to ride in the International Endurance Championship at Dibrugharh, Assam came in November from the Equestrian Federation of Assam. Amber’s mother, Allyson, herself a regular endurance rider, jokingly asked if Amber would fancy having a go. “To our surprise, Amber said yes, so it was then all systems go to get everything ready for her to travel to India. She has only been abroad once before, on a school trip to Paris, and she has never flown so we had to organise her passport and visa in quite a hurry”, explained Allyson. “Luckily her Dad has travelled extensively so I left it all to him to organise”, she added. Amber first sat on a horse when she was just 18 months old and was learning to ride properly when she was 5. “I was competing regularly in endurance at a low level and so it was a natural progression for Amber to join in” said Allyson. Amber competed in her first endurance ride when she was 10 years old, riding a Welsh Section A pony called Tilly, and then started competing her mother’s Fiord horse, following Allyson during the rides. Amber soon moved on to the higher mileage rides organised by Endurance GB, the governing body of the sport of Endurance riding in Great Britain, and competed in her first 80km ride on a part bred arab called El Cavalier that she was given on loan. In 2010 she completed her first 2-day 160km ride at Dukeries, as well as several other 2-day rides and became National Junior Champion. She has continued to up her game, coming first in a 90km FEI 1* ride at Hayward Oakes in 2011 and completing her first 100km graded ride in 2012. “She is very determined and aims to do a 120km ride this year and try to qualify for the under 21’s team by 2014”, explained Allyson. What better way for an aspiring young rider to start the 2013 season than a trip to India to represent GBR in their International Endurance Championship? Amber and her father will arrive in India on Thursday with a couple of days to acclimatise and find out what horse she will be riding in the competition on Saturday. “The terrain will be quite different to anything she has experienced, and it will be interesting to see what sort of horses they ride”, says Allyson, who has stayed at home to look after their own horses. “The ride takes place in the eastern Himalayas, along sandy river banks and through tea plantations, which I think will be terraced, so it is likely to be hilly. We have been told that the scenery is stunning”, she added. Getting on a strange horse will be no problem to Amber who is studying Horse Management at Bishop Burton College and regularly rides different horses. Regular updates will be posted on the Endurance GB facebook and Twitter. www.facebook.com/EnduranceGB or @endurancegb. The Mongol Derby is the world's longest and toughest horse race, a 1000km dash across remotest Mongolia aboard the semi-wild native horses of the steppes. It takes a very specific type of rider to tackle the hazards of the Derby; from exposure to sleep deprivation to broken bones, the Derby is a test of nerves, gumption and common sense as well as horsemanship. So just what is under the helmet of one of these Derby riders? We sent Mongol Derby chief, veteran of the inaugural Derby in 2009, and rather amateur biologist, Katy Willings, to investigate. Her research suggested they are an entirely disctinct species: Adventurist Equestrianus Mongolicans. Here she is with a head-to-toe look at the special features and key modifications of this most fascinating species, the Mongol Derbyist. Head - unusually level. Adv. Eq. Mongolicans is not prone to feelings of over-excitement, fear, or panic. The large cerebrum allows the rapid assimilation of information such as the geographical lie of the land for navigation purposes, or which horse out of a choice of 35 will be the fastest or kindest, or what is mutton fat and what is noodle in a bowl of mixed materials served at daybreak. On November 17, 2012, world-renowned equestrian and equine photographer, Manu Sharma, set a new endurance record for India. He has set the record for riding a Marwari Horse 612 kilometers in 12 days, a great feat of equine endurance and equestrian perseverance celebrated by Manu and horse lovers everywhere. The horse Jessica DiCamillo was scheduled to ride in the Abu Dhabi Presidents Cup on February 16, RGS SHA Strike Two, cannot travel due to European restrictions. Instead, she will be riding DJB Black AL Bodi (aka Diesel), owned by Darolyn Butler.